b. Feb 1, 1895, Maine, USA. d. August 31, 1973, Palm Desert, California, USA. I read Senses of Cinema‘s call for contributions on “Great Directors” with interest. Among the list of directors to be profiled were Cox (Paul) and Cronenberg (David), both of whom I’ve met. But among the list of those for whom you were looking for “expressions of interest” I noted Ford (John), who I am delighted to say I also met and who is quite simply the greatest director of all time. Why did Cronenberg and Cox (contemporaries of my own) get a look in before the man who Ingmar Bergman called the greatest director who ever lived? Why is Ford’s work seldom studied, when that of say Hitchcock is dissected in film class after film class? Because the great, great, great John Ford made so many films (and so many great films) his canon is virtually unassailable. I repeat myself in keeping with Orson Welles who after viewing Stagecoach (1939) 40 times before embarking on Citizen Kane (1941) said he was influenced by the old guys; the “classical” film makers, by which he meant “John Ford, John Ford and John Ford”. If the pantheon of classical music is “the three Bs” (Bach, Beethoven and Brahms), then it is arguable there is only one true great in cinema – and that’s the man who won more Academy Awards (five) than anyone before or since. Though he would like to have been Irish, Sean Aloysius O’Fearna was American, born in Maine in 1895, the eleventh and last child of an Irish family. “Jack” was introduced into the movie industry by his silent movie director brother Francis “Ford” (who probably took the name from the Model T and later played bit parts in his kid brother’s movies like The Quiet Man ). After working as a “cowboy” and riding as one of the Klansmen in D.W. Griffith’s The Birth of a Nation (1915), Jack began acting in his brother’s one and two reelers and it was not long before he was directing himself and upgraded his to the name of the Jacobean dramatist John Ford. 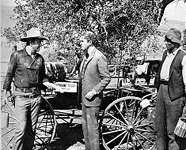 Claiming he got the job from Carl Laemle (founder of Universal) because “he yells real loud”, his shorts and early features, largely Westerns starring Harry Carey, are interesting, however it is in his silent feature The Iron Horse (1924), that what we now call “Fordian” is first evident. This quality would not emerge full blown however, until the late ’30s, when after a series of Fox period pictures starring the legendary pundit Will Rogers, Ford finally perfected his unmistakeable (but elusive) “style”. It is interesting to compare say Airmail (1932), which ought to be terrific (it is after all the model for Hawks’ very great Only Angels Have Wings ) to fairly routine late ’30s Ford pictures like The Hurricane or Wee Willie Winkie (both 1937). Most see Ford hitting his straps with his first directing Oscar for The Informer (1935), but for me, when Lincoln steps onto the balcony and commands the band to play Dixie to a Northern audience at the end of the Civil war in Prisoner of Shark Island (1936), we are seeing Ford at his best. 1939 is often cited as the great year for American cinema and it was certainly a bumper one for Ford. In a twelve month period, he achieved the astonishing task of directing Stagecoach, Young Mr. Lincoln (1939), Drums along the Mohawk (1939) and The Grapes of Wrath (1940) – all masterpieces. The last, which pipped the recently arrived Alfred Hitchcock for the directing Oscar with his Best Picture Rebecca (1940) , was shot by Ford exposing only 40,000′ of negative (i.e. a 4:1 shooting ratio) and on condition he be given two weeks preparation between Mohawk and Grapes. Various writers have attempted to categorise Ford’s post war work by decades, but I see little point. He returned to his milieu with Westerns from My Darling Clementine (1946), the story of Tombstone and Wyatt Earp (who had been a technical advisor on Ford’s early silent westerns), to late nostalgic works like The Man Who Shot Liberty Valance (1962) and Cheyenne Autumn (1964). He invented a hybrid form, the “cavalry picture” and his so called “cavalry trilogy” (Fort Apache , She Wore A Yellow Ribbon  and Rio Grande ) make a fascinating “movie marathon” for the uninitiated. He made Irish pictures, most notably his Oscar winning The Quiet Man, which Neil Jordan describes as cliché ridden, but eclipsing all Irish cinema since by dint of the sheer genius of its director. He made Navy pictures (and would retire a full Admiral) including documentaries in both Korea and Vietnam. Most noteable among these for me (and director Lindsay Anderson whose book on Ford I list below) is his first post war picture They Were Expendable (1945). Reluctantly pulled out of combat to make the picture, which for many years he disowned, Ford fuses the feel of real battle (the PT boat from which he “directed” the Normandy invasion was skippered by the man whose diaries provided the basis of the script) with the mythological – before the War was over, Ford had already turned its heroes from Macarthur (with whom he’d spent time in Melbourne) to the men and women who were left behind in the Philippines into myth. 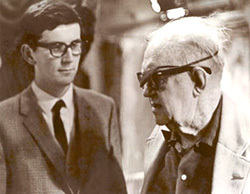 Director John Milius describes John Ford’s style in terms of the Japanese idea of “conservation of line”, saying Ford can do with a couple of “brush strokes” what it takes others six or eight to do. Early in his career, Ford talked about what he called “invisible technique”, to make an audience forget they were watching a movie. But later he refused to dissect his work, saying things had to be dead before dissection, and telling young directors like myself only to “make sure you can see their eyes”. The impact of an astonishing scene like Tom’s farewell to his mother at the end of The Grapes of Wrath is achieved with virtually television coverage. Yet only in Ford would the characters’ eyelines intersect at a point somewhere in the middle distance, as if they both see something spiritual. It is for me in the spiritual that Ford expresses the greatest we can hope our art to be. It is his capacity to mythologise; to ennoble that which might otherwise go unnoticed (like the image of the Philippino extra listening to the announcement of Pearl Harbour, or the “expendable” limping away down a beach, “glorious in defeat”, because the artist tells us they were and are). Orson Welles called John Ford the greatest “poet” the cinema has given us. He is at the very least the US’s greatest historian (his films having examined virtually every era from the Revolutionary War to Vietnam) and his landscape surpasses that of say a Remington. His images of the individual dwarfed by this landscape, of family and community huddled against the brutality (and primal beauty) of Monument Valley in The Searchers is unsurpassable. It is not necessarily a true history, but as Ford says in The Man Who Shot Liberty Valance, “when the legend becomes truth, print the legend”. John Ford was more than a filmmaker. He was a legend. Rather than be daunted by the full filmography below, I shall presume to list some Ford films readily available in most larger video stores in suggested viewing order. I am pre-supposing the reader has little or no knowledge of Ford’s work (you might use two stores rather than depart from this order, at least at first). Do not begin with The Searchers – it is an acquired taste and without a knowledge of Ford’s milieu, it will seem like little more than a pot-boiler (which it was). But viewed with a little knowledge of Ford’s work (and the now lost Western genre), it will soon find its place. The Grapes of Wrath – Probably Ford’s most accessible work to a modern audience. Note particularly the contrast of highly stylised chiaroscuro lighting (Greg Toland a year before Kane) to the documentary realism of say the encampment scenes. They Were Expendable – another realist piece, remarkable in that Ford came out of active duty to re-create what he had just experienced, yet gave this story of the US’s greatest defeat in WW 2, a mythological sense of historical perspective. Note the final scene between John Wayne and Donna Reed. How Green Was My Valley? – a non realist evocation of life in a Welsh mining town a century earlier. This is not shot by Toland, yet note Ford’s composition and lighting at the same time as Kane was being shot. Allow yourself to be swept away by the sentiment. A complete contrast to the previous two films and yet so clearly the work of the same director. Fort Apache – First of the cavalry trilogy. Loosely based on Custer, it is a more accessible introduction to the Western genre, being Ford’s first film in a new sub-genre. She Wore a Yellow Ribbon – Third of the cavalry trilogy (but shot second). It won the Academy Award for Technicolor cinematography (note in particular the thunderstorm sequence, extemporised during a real storm “under protest” by the cameraman). And John Wayne’s performance as an old man, two years after Fort Apache. The Man Who Shot Liberty Valance – do not be put off by its studio bound look, or the age of Wayne and Stewart playing young and old. This does not need Monument Valley, being a morality play of Shakespearian proportions. 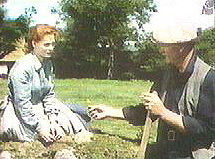 The Quiet Man – You are now ready to wallow in Ford sentimentality. But note the almost expressionistic treatment of the boxing flash-back (when he wanted to, Ford could grab an audience by the throat). The Searchers – Warrants and rewards with repeated viewings. Apart from containing the best suspense sequence ever filmed (the Indian raid), consider the time frame of the story – Ford effortlessly has years pass without in any way diluting the urgency of the drama. To quote John Milius: “…anyone who thinks John Wayne can’t act has not seen The Searchers “. Consider the relationship between Ethan (Wayne) and his sister in law early in the story. Then Ethan and Martin (the searchers) as the story progresses. Also the sense of family, community and finally man’s plight in a hostile universe. (There are many versions on tape, but the “Technicolor restoration” on VHS is better than the DVD). You are now ready to watch any and all of Ford’s work. Anderson, Lindsay. About John Ford, London: Plexus Publishing, 1981. Ford, Dan. Pappy – The Life of John Ford, Prentice Hall, 1979. All-inclusive fan site, with lots of news and information on books, films, a guestbook, excerpts from Tag Gallagher’s book on Ford, biography and a Christmas wish from John Ford! Nice colourful page with great poster reproductions. Some personal thoughts on various Ford films. David Hart’s study notes for this film. Richard Franklin is an Australian director, writer, producer of Patrick, Roadgames, Psycho II, Hotel Sorrento and Visitors. He also teaches filmmaking at Swinburne University of Technology, Melbourne.